The digital content network Collab, which represents more than 300 creators on platforms like YouTube, Twitch and Instagram, is launching an ad sales unit. The new business unit will be led by Art Zeidman, who will be executive vice president, growth for the company. Zeidman previously worked in ad sales and growth at various companies, including Pixability, Unruly Media and Google. Collab is a multichannel network for content creators, providing sales and support for its partner channels. While some of the large, venture-backed MCNs like Awesomeness TV and Defy Media ultimately failed, Collab has used its smaller scale to its advantage. “Although the MCN business at large is relatively challenged, Collab has been completely organic in its development and growth, and has never taken any investor money. It has devoted its entire business up until this point just to making creators better, helping them earn a living on YouTube, Instagram and Twitch,” Zeidman tells Digital News Daily. While Collab is independent, it still has scale. According to Comscore, it is regularly the No. 9 or No. 10 most-watched network on YouTube, with an average of nearly 7 billion views each month across its platforms. Collab’s channels have an audience of around 60 million U.S. households each month. The company has worked in the branded content space for some time, but the new division is meant to boost more traditional ad sales, particularly on platforms like YouTube. “Collab’s content significantly overindexes on connected TV and viewing through game consoles versus the YouTube average,” he adds. Zeidman also argues that the nature of its networks means that Collab channels are a safer place for marketers to buy against. Collab’s partner list skews towards positive, more family-friendly content. 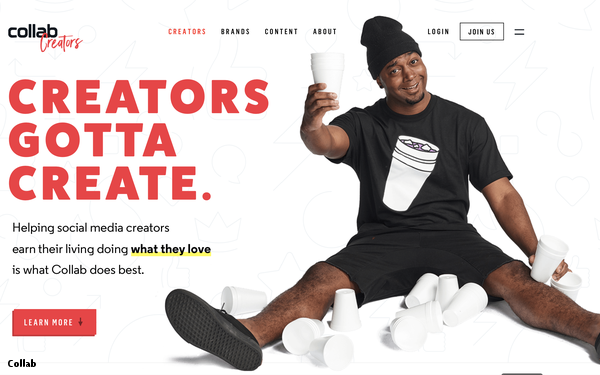 Partner channels include David Dobrik and the “Eh Bee” family.